Sosta del Duca is a marvelous family-run enterprise. Sandra, Simona, Riccardo and Nicola love their property and take incredible joy in greeting you in and showing you around. And three times a week for most of the year, they are brilliant at shifting gears and becoming the most accomplished and friendly ristorante staff you have ever met. Simona’s affectionate smile greeted us at the reception desk and immediately made us feel welcome and appreciated. Our check-in was quick and efficient and our room was ready. Riccardo took our bags and gave us a running commentary that provided all the details we need to know about how everything works. 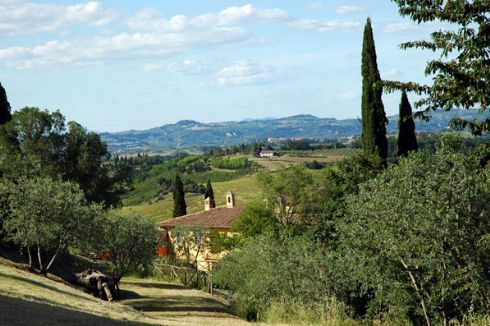 This gave us plenty of time to go outside and take in the view of the Tuscan valley below, with its fertile orchards and olive groves. From Sosta del Duca you get the feeling that you can almost see forever, it is perched so high. Sunset was still an hour away, so we set off on a hike on the country road that leads to San Gimignano. It was tempting to go off down some side roads and explore the country homes and villas down the way. The real treat came at dusk, when the lights of San Gimignano came on and we could marvel at its medieval charm just in front of us on the horizon. 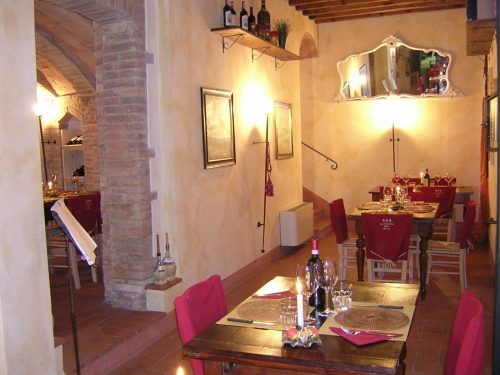 When we returned, it was time to take our table at La Stanza del Duca, as the family ristorante is called. We made our selection from the extensive wine list, which includes not only local Tuscan specialties, but also carefully chosen vintages from all parts of the country. They then brought us each course with the same cheer and attention that had graced our arrival. The food, to say the least, was excellent! Italy is known for its hospitality, its beauty and its charm. At Sosta del Duca, this tradition is taken to new heights. 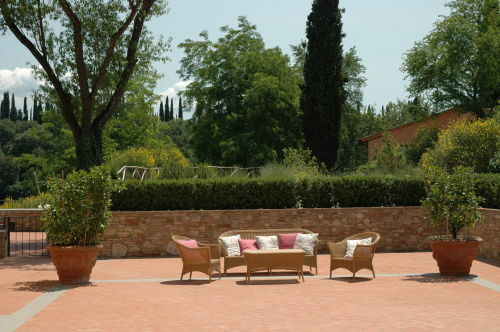 There are fifteen well-appointed and stylish apartments at Sosta del Duca. See them here. 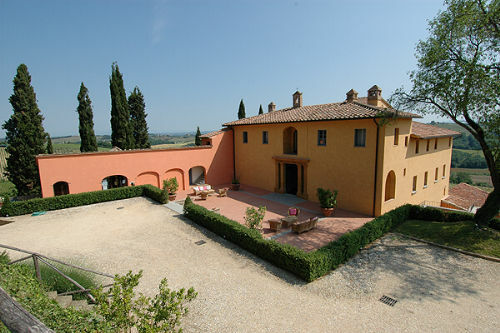 This entry was posted in Tuscany and tagged Italy, san gimignano, sosta del duca, Tuscany. Bookmark the permalink.